Join us as local author Michael Ponsor speaks and reads from his new book The Hanging Judge in the Woodbury Room of the Jones Library. The Hanging Judge was selected as one of the Must Read Books at the 2014 Massachusetts Book Awards. A drug dealer and a hockey mom/nurse are killed in drive-by shooting in Holyoke, and a rival gang member is arrested as the prime suspect. When the case is moved to federal court so that the prosecutors can seek the death penalty, a judge who has served only two years on the bench must preside over his trial. 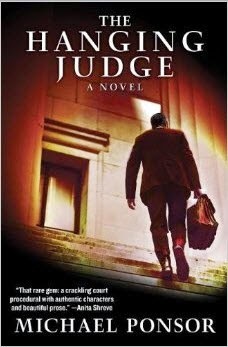 With a colorful cast of primary and secondary characters, this legal thriller is told from the unique perspective of the presiding judge and is based on the author's own experience. Michael Ponsor graduated from Harvard, received a Rhodes Scholarship, and studied for two years at Pembroke College, Oxford. After taking his law degree from Yale and clerking in federal court in Boston, he began his legal career, specializing in criminal defense. He moved to Amherst, Massachusetts in 1978, where he practiced as a trial attorney in his own firm until his appointment in 1984 as a U.S. magistrate judge in Springfield, Massachusetts. In 1994, President Bill Clinton appointed him a life-tenured US district judge. From 2000 to 2001, he presided over a five-month death penalty trial, the first in Massachusetts in over fifty years. Judge Ponsor continues to serve as a senior U.S. district judge in the United States District Court for the District of Massachusetts, Western Division, with responsibility for federal criminal and civil cases in the four counties of western Massachusetts. The Hanging Judge is his first novel.